Written for new shooters who have never held a gun, and soon discovered by bird hunters and clay target shooters. Shoot Where You Look℠ offers sound advice to new or Master Class shooters. SAFETY is our number one concern. 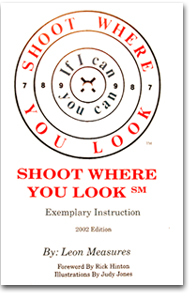 Shoot Where You Look enables a new shooter to master the basics of expert shooting without leaving home or firing a shot. The Master Class shooter is able to maintain a degree of expertise, or add a target to a score card, by practicing at home or in the office. The technique can be traced back to a kid named David who killed a giant, and saved a nation, with a Shepherd's sling and a smooth round rock. When the technique is transferred to a shotgun, rifle, handgun or, bow, magical things happen. Shoot Where You Look was written be the man who lived the experience. Leon Measures has been shooting for more than 70 years and teaching for more than 60 years. This book is an attempt to share some of what he has learned with today's shooters and to leave the Shoot Where You Look system to future generations. Amazon Kindle - Buy Now! Apple iBooks - Buy Now! Barnes & Noble Nook - Buy Now!